Bernie Sanders Tries Out New Style in N.H.
Sen. Bernie Sanders (I-Vt.) was partway through his 45-minute stump speech in front of an overflow crowd at the Warner Town Hall in New Hampshire on Saturday when three kids in Halloween costumes came trooping in with their parents and slipped into seats that had hurriedly been vacated for them. A short time later, the presidential candidate introduced the crew as his son, Levi Sanders, daughter-in-law Raine Riggs and grandchildren Sunnee, Ryleigh and Grayson, who live in Claremont, N.H. As he finished his speech, Sanders called them onto the stage for a quick photo op. Six months into his presidential campaign, the upstart candidate dubbed a "grumpy grampa" is tweaking his image. In New Hampshire, he was hell-bent on showing people he's human. Sanders is still delivering the impassioned doom-and-gloom stump speech about economic inequality, but he is also fiercely defending himself against criticisms that his solutions are too outlandish and he's not sufficiently personable. A Saturday New York Times article described Sanders walking down the street in Manhattan, "talking as little as possible to people." The reporter went on to note something Vermonters know well: "To Mr. Sanders ... political schmoozing is a phony business, and anathema to his total focus on weighty isses." For his campaign strategists, such perceptions signal it's not enough that Sanders is dancing on the "Ellen DeGeneres Show" and dropping in on the "Today" show. He's also got to let the world see him trick-or-treating with adorable grandkids. At New Hampshire's Lebanon High School, Sanders opened his speech to a crowd of more than 1,000 by riffing on comedian Larry David's "Saturday Night Live" imitation of him. "The media think I do not have a sense of humor," Sanders suggested. "My name is Larry David, and I am impersonating Bernie Sanders," he said without changing anything about his delivery. "So there it is. I have a sense of humor, OK?" By the end of the weekend, Sanders had also released his first television ad of the campaign, an upbeat introductory piece that ends with a female narrator intoning: "Bernie Sanders. Husband, father, grandfather. An honest leader building a movement with you, to give us a future to believe in." Sanders' counterpunch to the criticism that he's just too gruff also came Saturday in the form of the Abominable Snowman, the White Witch and Sonic the Hedgehog — the costumes Levi's three children were sporting for Halloween. After the Lebanon speech, Sanders joined them on a trick-or-treating excursion — with Washington Post and ABC reporters in tow. The TV coverage showed him walking alone ahead of the children at one point and handing out half-hearted waves and handshakes to parents and other passersby. Try as he might, Sanders really is awkward at the real-person thing. "It's amazing to see you out here. I was shocked," one man said, according to a pool report provided by Post reporter John Wagner. 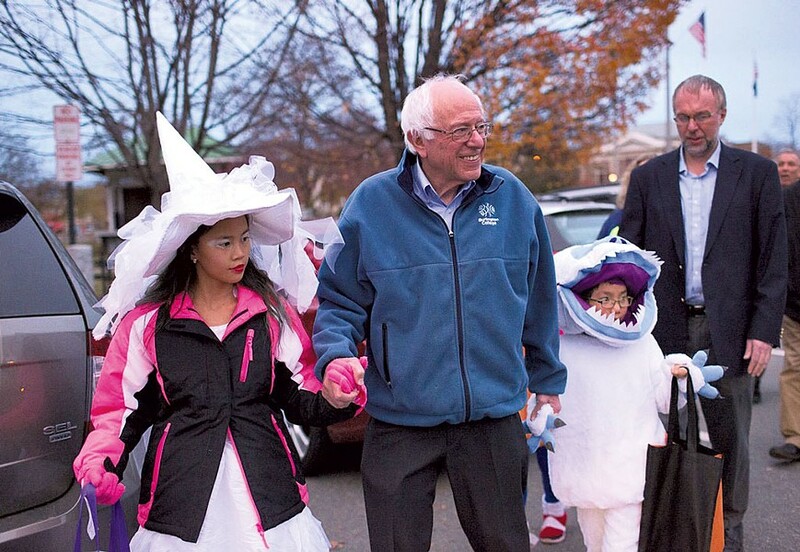 Sen. Bernie Sanders trick-or-treating with his grandchildren in Lebanon, N.H.
"I'm trick-or-treating, you know," Sanders replied. For the 74-year-old candidate, who is just three months from first-in-the-nation primary votes, Halloween was also a long day of serious campaigning. As he made stops in Concord, Warner and Lebanon, Sanders was still vintage Sanders. 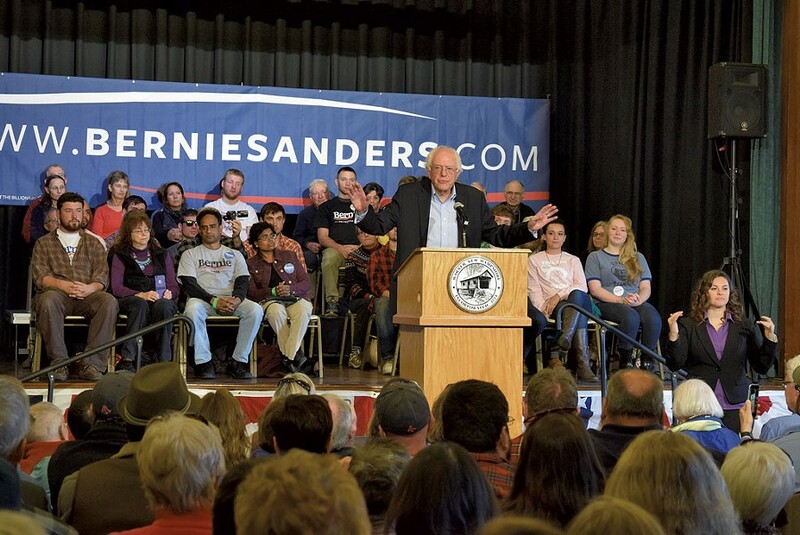 Riding shotgun in the Ford Fusion owned and piloted by longtime aide Phil Fiermonte, Sanders kept up the same exhausting town-to-town, hall-to-hall pace and pounded out the familiar antiestablishment message that has marked his political career. "We have seen trillions of dollars go from working families to the top one-tenth of 1 percent," he told the crowd of 400 packed in the Warner Town Hall, while another 300 listened out on the lawn. "We should not have that kind of wealth inequality." But with the stakes growing ever higher on the national stage, Sanders' campaign also appeared increasingly image-conscious. In Warner, as the audience filed into the town hall, a volunteer approached two twentysomething men. "Can I have you on the stage? I need some more young people," she told them. They were among the group that provided a fresh-faced backdrop for Sanders as he delivered his subsequent, televised speech. The candidate did not, as promised last month, explain Democratic socialism to his Saturday audiences; spokesman Michael Briggs said a speech on that subject is coming in the next few weeks. But along with decrying income inequality, Sanders made time to address related criticisms, emphasizing that his ideas aren't as out there as some suggest. "It is not a radical idea to say that instead of cutting Social Security, we're going to raise Social Security," he preached in Warner. "It's not utopian to say that in the United States of America, we should join the rest of the industrialized world and guarantee health care as a right, not a privilege." "Sometimes my words have been mischaracterized," Sanders told the Warner audience, his own voice rising. "I have said that as a nation, we have got to stop shouting at each other on this issue, that I believe there is a broad consensus, not of everybody, but of the vast majority of the American people, for sensible and important gun-show legislation." To many in the audience, Sanders was shouting all the right messages, with no need to tweak a word — or his personal style. Alayna Josz introduced Sanders in Warner. She said politics had never mattered to her — a Champlain College alumna who grew up in in New Hampshire and returned there after graduation. "No politician seemed to share my views or even use words I understood," Josz said. "[Sanders] has changed everything for me." Vermonters Arwen and Alex Farrell of Norwich crossed the border to hear the candidate in Lebanon, N.H., on Halloween evening. "I'm drowning in debt," Arwen Farrell said. "We both have multiple degrees. Our jobs don't pay enough." As the young couple slipped out the door at the end of Sanders' speech, Farrell said she's been "amazed" at his campaign's success. In spite of Clinton's climb in the polls, she said, she has no sense that Sanders is fading. Barbara Lurie of White River Junction also liked what she heard. "I believe in everything he believes in," she said, wearing a Sanders campaign sticker. But Sanders hadn't quite sealed the deal for Lurie — and it had nothing to do with his sense of humor. "I'm a little worried whether he would be able to win the election," she said. That night, after the crowd dispersed, Sanders zipped back to his home in Burlington's New North End. That's where WCAX caught him on camera, this time greeting trick-or-treaters — and a second set of grandchildren — at his own front door.